This Time of Year - July is inspired by patriotic celebrations, fireworks, picnic, bar-b-ques and family fun. 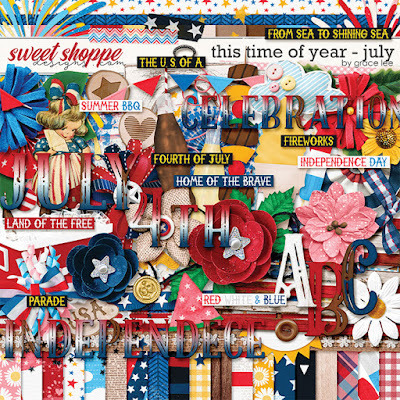 Document your red, white and blue summer events with this wonderful collection's bright colors and sunny elements. and 79 elements. The elements included are: 1 arrow, 1 banner, 2 bows, 3 buttons, 1 cloud, 2 drinks, 4 fireworks, 1 flag, 13 flowers, 3 foliage, 4 frames, 1 girl, 1 icebox, 1 ice cream, 1 kebab, 6 labels, 4 paint, 1 popsicle, 3 ribbons, 2 ric ran, 2 scatters, 2 strings, 2 tape, 4 titles, 10 word art, 1 watermelon, and 3 wood chips. This kit is included in a bundle!